Finally taking a crack at the one and only Mutant Warthog Punker Thug Bebop! I've resized and improved the classic Arcade spritework 120% for this guy and I'll be doing a whole mess of additional custom sprite-work for the rest of his attacks. I'm not too familiar with the vital details of the character beyond what I can recall from my childhood & the whole punker-turned warthog premise. So any and all information/ fun-facts about him that I can implement into the character are welcome here. Any canonical attacks or weapons he's used in the show would be great to mention in this thread as well. If you've got any ideas on what you'd like him to play like or want to post some Bebop related art I'd very much appreciate it. Looks really cool. Any reason you chose green pants instead of black ones? YES. I'm glad to see you working on stuff again. I'm so glad you're spriting/coding again and especially glad you prioritized Bebop (my favorite of the TMNT bad guys). I'll try to think up all the help I can. Bebop likes his sawed-off auto-fire laser blaster, but when he decides to punk out old-school, he's been known to swing around swing around a ball-and-chain flail, either in his hand (Turtles on Trial episode) or on top of his head (TMNT 3 on NES). Strangely enough, he might also carry around a mouse in his pocket (Catwoman from Channel Six episode). He has a larger vocabulary than most people would think, and can be both witty and articulate when left to his own thoughts. 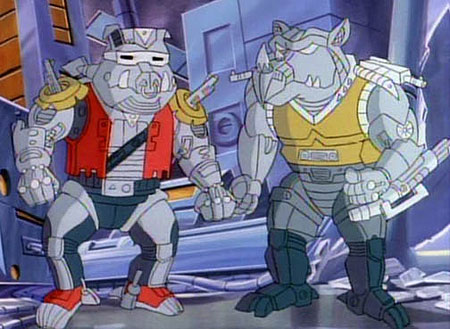 Compared to Rocksteady, he appears to have a more pronounced love for comic books and videogames (references in Enter the Shredder and Krangenstein Lives episodes). He's black, y'all. Just saying, haha. I know that's just the arcade palette though, and I'm sure you'll be doing several. @Cryomancer: Don't worry I won't be whitewashing him, We get so few canonical black characters in media I won't be ignoring the original character design. 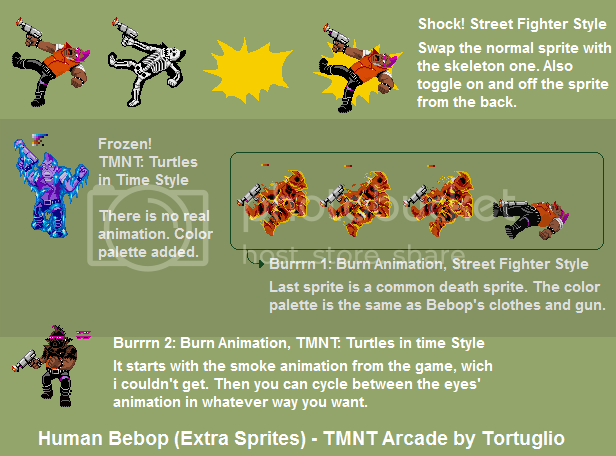 OG Bebop will stay Bebop, I was even hoping to use Tortuglio's Human Bebop Custom Sprites for his Retromutated animations. The funky colors are just for the color separation of the sprite. 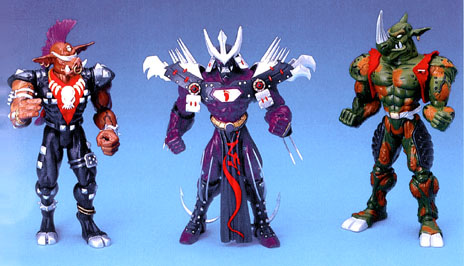 It adds much more versatility to the outfits that Bebop can display. By having all of the elements uniquely indexed with unique colors I can change his arm color independent of his face & torso, so some of Bebop's palettes will be able to have shirt sleeves or gloves/no gloves. Yeah me too, had to give priority to Bebop especially since they left him out of Sega's Hyperstone Heist... He deserves top billing this time around. 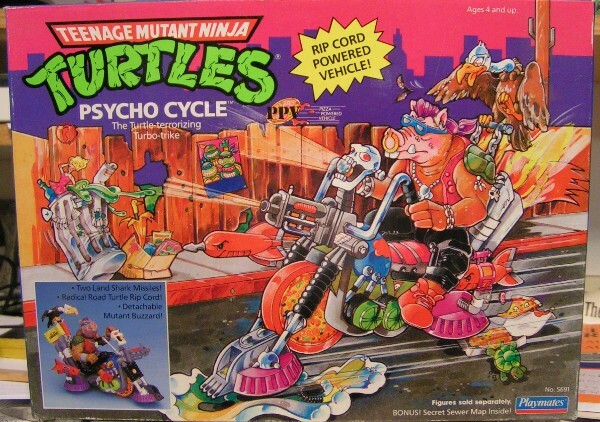 Though I don't remember it ever being used in the cartoon, Bebop looked very much at home riding his Psycho Cycle! 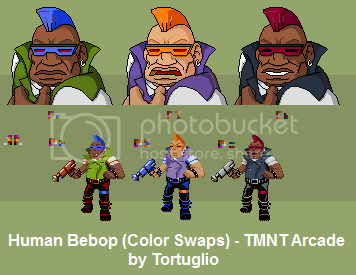 I was even hoping to use Tortuglio's Human Bebop Custom Sprites for his Retromutated animations. Cool! Glad i can contribute, in some way, with your work, dcat. Glad to see you around again with this stuff. Maybe you already have them, but i'm leaving the sheets here for quick grabbing (with some notes that i don't remember writing ). Also, remember there's a "from-human-to-mutant" sheet, if it's any good to you. The complete sprite sheet for Human Bebop (with the clash sprite added), an extra custom sprites sheet and a color swap sheet (with color palettes). 1-In the first sheet, there's a variation for the fase for the animation when Bebop is hit and leans back. 2-The extras sheet is pretty much explained there. 3-In the color swaps sheet, in the left side of the color palettes you have Bebop's original colors, and in the right side, the color swaps. As you noticed, there aren't the same amount of colors on both sides. When there aren't any replacementes color, it's that the color swap uses the same color than the original. I hope you can understand it. Last, there's a color palette far on the left side, i have no idea what was that for, i don't remember but i left it there, just in case. That is all. Maybe i'll finish the Human Bebop for TMNT 3 for the NES, but i don't see myself doing the Arcade Human Rocksteady anytime soon. Don't wanna give false expectations. I just have other projects lying around that i would like to take care of. FYI, i'm the "movie business"... wich in Argentina is not a business, so i work as an editor for whatever it comes, or camera man. Anyways, hope you like them, and thank you very much for your comments, it gave me the final energy to end this bebop stuff. See ya! Oh, man. That portrait, nice! Thanks Tortuglio you did great work with these and I always wanted to put em to good use. That morphing animation of human Bebop to warthog Bebop is great for a pre-battle intro. You'll get a shoutout in the README credits for sure once he's completed. I got 2 more animations done today. Last edited by dcat; 05-24-2017 at 12:12 AM. Got two more attacks polished. Your Bebop customs look great, dcat! The elbow drop is impressive and I like the little flair of his glasses on the downward thrust attack. Glad to have you back in the Mugen spriting game! Woah, that new screenshot really shows how big he is! Thanks for sharing, dcat! Hey guys, been a while since I've posted progress with Bebop. Sprited New Jumping frames for Bebop as well. New Air Tazer Punch -- Bebop could fire off a blast as he hits the enemy with his blaster, maybe knock them back into the wall for more juggling once he lands, I dunno yet. I'm getting close to having enough done for a short preview video, I'm gonna keep grinding away at him until he's up to my standards. 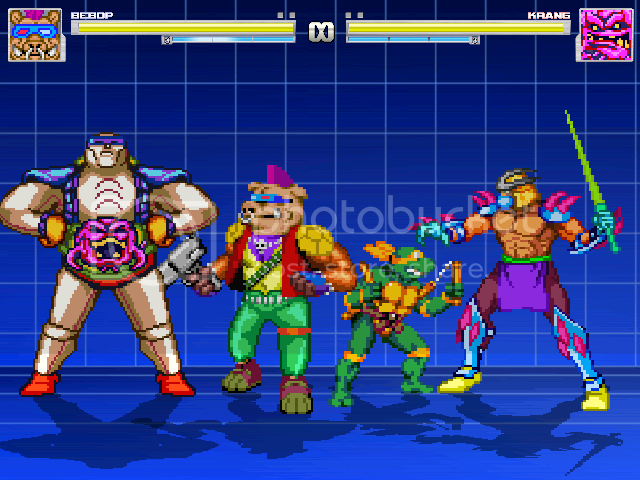 Also just so everyone's aware I keep seeing requests asking about my custom MUGEN character sprites on other forums, just to let everyone who's interested know; they are ALL Open source, free to use them for your own TMNT projects. Credit my original work if you like, but go ahead and feel free to include them in your other TMNT mods or whatever, spread the word. If anyone here has any audio clips of Bebop from the original 80's cartoon It'd be greatly appreciated I barely have one or 2 sounds for him so far. 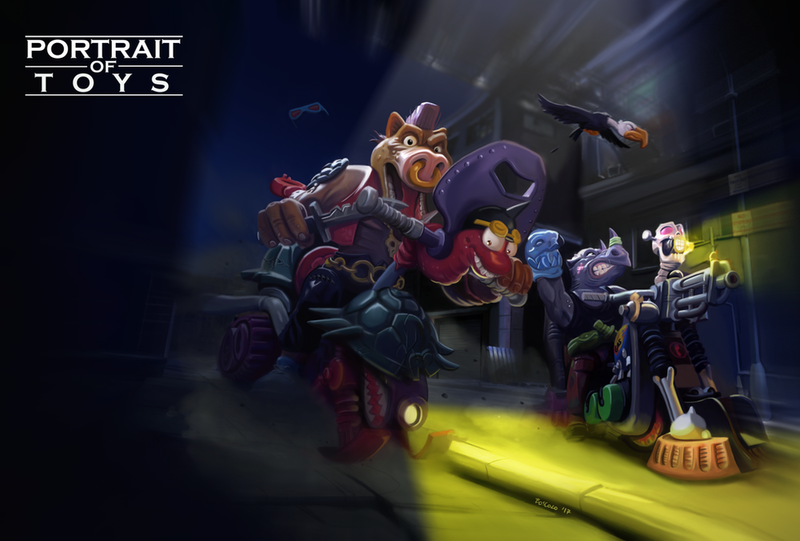 Or if you know of a Voice Over artist who has a similar sounding character let me know so I can check it out. I've used this method previously with including clips of DBZ's Garlic Jr. in my Krang character and of Sonic the Hedgehog in Leonardo. I really like the subtle animation details like how his glasses fly up over his eyes to convey a sense of motion and momentum!